Our Travel Blog – Page 70 – Travel and tourism news, special promotions for tours, cruises, resorts, specialty travel. How Do I Pick a Cabin? Let’s explore what the different types of cabins that are available, which locations are the most desireable and which locations you should avoid if possible. TYPES OF CABINS Single: Accomodates a single person. May have a single bed or a full-size/double bed. Double: Accomodates two people. Twin beds, double bed or queen/king. Triple/Quad: Accomodates three or four. The third and fourth person may be accommodated on a sleeper sofa, a folding upper bed (like a bunk bed) or any combination thereof. Inside: a cabin with no window or view Oceanview: a cabin with an oceanview through a porthole or window. Mini-suite: A larger oceanview cabin with separate sitting and sleeping areas. Suite: Usually the best grade of accommodations with a separate bedroom/sleeping area, living area and sometimes a dining area, wet bar and lavish bathrooms. WHAT TYPE OF CABIN IS BEST FOR ME? This is a purely personal issue and mitigated by many factors such as preference, size needs, budget and of course, availability. If you don’t need a cabin with a window and wish to save the extra money, by all means, take an inside cabin. They’re an excellent value. If you’re like me, and need to see daylight or are even slightly claustrophobic, take an oceanview cabin. WHAT ABOUT BALCONIES AND SUITES? Do you need a balcony or suite and are they worth the extra price. Once again, this depends on your priorities, wants and needs. A balcony is a great plus if you like to have your own (Semi) private deck space to relax without intrusion from other passengers. I don’t find them a “must” on a seven night Caribbean or Europe itinerary, but they are a nice extra.. Where I find they are really worth the extra cost is on longer itineraries and when cruising scenic regions such as Alaska, the Norwegian Fjords or the Panama Canal where prime viewing space on deck is at a premium. Balconies are a great place to enjoy morning coffee, an afternoon nap or evening cocktails as you watch your ship depart from port and once you sail with one you probably wont want to do without. Mini-Suites and Suites will provide you with extra space, but that space comes at a price. You’ll most likely get a separate sitting area, a sleeping area or separate bedroom and many come with a much larger bathroom, whirlpool tub and walk in closets. While suites tend to be closer in size to a hotel room, check out the mini-suites with caution. Many lines mini suites are simply standard cabins with a balcony. Choose the location of your cabin with care. Look to see what areas are above, below and adjacent to your cabins. Showlounges, Discos, kitchens/serving areas and stairtowers/elevator lobbies can be a source of noise. If you have a jogging track or deck area above, you may be disturbed in the morning by the sound of crew members dragging deck chairs about or the thump-thump of passengers out for a morning jog. You should also avoid cabins at the very front (bow) and down low to the rear (stern) of the ship as you are more likely to experience movement and machinery noise from the bow/stern thrusters, anchors or propulsion machinery. A mid ship location is always best but don’t be afraid to go forward or aft and if given the choice, go aft rather than forward. And while forward facing balconies overlooking the bow may present magnificent vistas and views, they can be quite windy. Midship balconies are the most plentiful, but if I can get an aft facing one overlooking the wake, I’d go with that. Yet another very important factor when choosing a cabin. In many instances, you will be offered the opportunity to choose and specific cabin or a “guarantee”. A “guarantee” is simply a guarantee by the cruise line that you will receive a cabin in the category you booked or possibly a cabin in a higher category. You may also be offered what is now referred to as a “run of ship” guarantee which means the cruise line is simply guaranteeing you space on the ship and can wind up with the lowest category or possibly a very nice and substantially upgraded accommodation. It is very important to remember that when choosing a cabin on a “guarantee” basis you will have little to no say in what cabin you are assigned. If location is important to you, don’t take this gamble. These can result in accommodations with which you are pleasantly surprised but can also lead to extreme disappointment if you are placed in a less than desireable location. A cabin chosen with care can make or break your cruise experience! Copyright © 2003, Cruisemates. All rights reserved. By this time, you should know that no one pays full brochure rates for a cruise – it’s like the sticker price of a car, a figure to base discounts on. And remember, a bargain’s only a bargain when you wind up cruising on a ship that fits your personal interests and lifestyle. Never, never select a ship based on price alone, or just to save a couple of hundred dollars. Narrow your search down to one or two ships you’re sure you’ll love, then start looking for the best rates on those particular vessels. If you’re looking for a last-minute discount, be prepared to compromise on cabin location – the best staterooms go early. Bargain hunting is also affected by luck–looking in the right place at the right time. But with the volatility of cruise prices, you can easily wind up paying a much lower price than you dreamed possible, or upgrading to a cabin you couldn’t otherwise afford. To determine whether the deals you find are true bargains, start the process by determining the basic rate the lines are charging for those cruises. The quickest way to find these prices is at the cruise line’s web site (you’ll find links to all cruise line web sites in CruiseMates’ “links” area). A few cruise lines also offer online discounts exclusive to web surfers. Don’t rely on last minute bargains, especially in cruising regions that tend to be fully booked each year during peak season, like Alaska, New England/Canada, Bermuda and Europe (unless there’s a major upheaval like the Kosovo conflict). You may actually end up in a less desirable cabin at a higher price. Your best bet is to go with the cruise lines’ advance purchase discount. While it’s a buyer’s market in the Caribbean right now, cabins are almost impossible to find during summer months, when ships are full of families. Start bargain hunting in the Sunday travel section of your hometown newspaper. Many lines offer regional bargains, so you might be entitled to a super deal aboard a wonderful ship that is not available outside your area. Find a local travel agent who specializes in selling cruises. This person may be part of a “cruise only” agency, or the cruise specialist in a full-service company. Tell your agent you’d like to be added to mailing lists and are particularly interested in bargains aboard a specific ship. Travel agency faxes run 24 hours per day receiving notices of terrific deals. Use CruiseMates’ new “I Need A Cruise” bargain finder. You simply list the ship, dates and any other pertinent data, and agents will e-mail you with their best deals. Check out CruiseMates’ “News and classified advertising areas. Also, many travel agencies with web sites offer free newsletters – sign up for several and you’ll get lists of new bargains weekly. The best way to find a terrific agent is by referral. I know several CruiseMates members so devoted to their travel agents, who give them fantastic service and great rates, that they wouldn’t switch to save $100 with another person. They found this “dream” agent on the internet by referral. While it’s true too many agents are simply order-takers, there are some experienced, outstanding pros who offer invaluable advice. Visit the internet auction sites. We’ve seen very good ships with terrific deals on their lists. One of our favorites sites is All Cruise Auction. Whether it’s a newspaper ad, newsletter or internet site, look at the small print. Does the price include port charges/taxes? If not, you must factor in this extra charge to determine your “real” price. In addition, when communicating with a travel agent, ask if they can give you a ballpark estimate of the airfare between home and the port. When traveling with children, you can save a bundle when they share your cabin. Ask your agent which cruise lines have the best rates for kids (sailing as third- or fourth-cabin mates). Cruise lines frequently offer “specials” for kids, and this can lower your cruise cost significantly. Copyright © 2000 – 2003, Anne Campbell. All rights reserved. Visitors to Tuscany for many reasons. Many come in search of fine art, others to explore the extraordinary countryside. Gourmets and wine buffs descend on Tuscany to enjoy the simple yet wonderful cuisine and wine. Walkers enjoy the mountain paths, cyclists the rolling hills, summer vacationers the sea coast and islands. Students come to learn the beautiful Italian language and culture. There is a lot to see and do in Tuscany, the difficulty is really where to start. Certainly most should start with Florence, and continue on to Siena and Pisa (a tourist trap, but one worth the hassle). The cities of Arezzo, Cortona, San Gimignano and Lucca are all a very worthwhile use of your travel time. One of the beauties of the region is that it is dynamic and ever changing which begs one to return again and again. See the Masters in Florence museums. The Uffizi Gallery is a world famous art museum. Here you can feast your eyes on hundreds of paintings by Renaissance masters. Artists include Giotto, Botticelli, Raphael, Michelangelo and Leonardo da Vinci. Then head over to the Accademia where you’ll find Michelangelo’s statue of David – one of the most famous sculptures in the world. Stroll around Siena. Siena is a well known town dating from medieval times. One of its most popular piazzas is the Piazza del Campo where you can sit down, relax, and enjoy a glass of wine or cup of coffee and indulge in people watching. If you feel energetic, you can climb to the top of the bell tower for breathtaking views of the surrounding area. Visit Lucca. Lucca is a Tuscan town dating from 180BC. Founded by the Romans, there’s a 1900 year old amphitheater to explore and a sixteenth century brick wall that encloses the city center. If you are looking to work up a sweat, you can walk along the 2.5 mile long brick wall. Take a Tuscan cooking class. If you’d like to know how to make authentic Tuscan dishes, then why not take a cooking class in Tuscany? There are quite a few different cooking schools in the region that offer anything from one day courses to intense week long courses. Count the tower houses at San Gimignano. This town is 1,000 years old and is perched on a hill. Only 14 tower houses are left standing today which were a sign of wealth in ancient times. San Gimignano features churches and museums, as well as the Fortress of Montestaffoli. Visit the Leaning Tower of Pisa. The town of Pisa is approximately 50 miles from Florence and is easily reached by train. In recent years the tower has been under renovations to shore up the lean. It is a bit of a tourist mecca, but still worth the trip. Explore the Maremma region. The Maremma region is located in south-western Tuscany. This region boasts hills, mountains and the ocean. You can indulge in pleasures such as eating simple Italian food and tasting the wines of this region. O r if you feel like taking a dip, the thermal baths of Saturnia have the cure for what ails you. Take an art class. Be inspired by the same landscapes as the Italian masters. Not only can you take a class in painting, but lessons in pottery, sculpture, drawing, ceramics and mosaics are also offered at the various art schools in the region. Explore Cortona. If you’ve read Under the Tuscan Sun by Frances Mayes, then you may be familiar with Cortona. The Etruscans first lived here centuries ago and today it’s a town that offers visitors a feast of history and art. Ready for the food, art and wine of Tuscany? Contact R and B International Travel and get started planning your trip. The largest country in Western Europe, France looms large in the mind of the traveler as well. It’s coastline takes in three seas and its interior hosts rich pastoral vineyards and the most sophisticated of urban centers. The Alps and Pyrenees for natural geographic barriers for the nation historically. French is one o f the most widely spoken languages, heavily influencing the English language and culture. The French take their holiday time seriously, with more than 25 days of paid vacation time each year. France’s large size and geographic diversity means that its climate is extremely varied from region to region. From the long summers and abundant sunshine of the Mediterranean coast to the temperate regions of the interior and the Atlantic to the cold winter playgrounds of the Alps, the climate in France makes for plenty of recreational opportunities year-round. In both a historic context and in modern times, the impact of French culture is hard to over-state. Architecture in the middle ages was heavily influenced by French styles and early French literature gave rise to the ideals of courtly love and chivalry. Today, Paris holds sway over haute couture and haute cuisine. A holiday in France can range from city visits to special interest travel in the wine country, river cruises, culinary tours and spa tourism. Tourism from North America in the World War II generation maintains a keen interest in Normandy and the sites of great battles from that war. France maintains its ranking as one of the most popular destinations for inbound tourism. The completion of the Channel Tunnel enhanced the ease with with travelers could move from the United Kingdom to the continent and made Paris a hub for traveler transport for Western Europe. The great museums of Paris remain some of the most popular attractions for visitors. Institutions like the Louvre and the Musée d’Orsay host extraordinary collections of paintings, sculptures and antiquities. The Côte d’Azur cities and beaches are popular with European and Canadian tourists, and increasingly so with a resurgence of travelers from the United States. Terrace cafés, quaint streets and blue oceans attract visitors looking for the essence of the French Mediterranean life and culture. The wine country of France remains one of the most popular culinary and wine vacation theme locations in the world. Hosted tours and self-drive itineraries alike are available to travelers wishing to sample the fine wines, food, scenery and the grand chateaux of the wine regions. Are you ready to getaway to France? Contact R and B International Travel and get started. Recently we’ve all been hearing a lot of our clients telling us that they are booking a condo directly with an owner, rather than with a travel agent, because it costs less. Before you make that decision, let us explain the benefits of booking through a travel agent and a reputable management company, like Outrigger Hospitality. Here are three great reasons to book with a travel agent. You will be able to check-in and check-out at the front desk of the property vs. having to go to another off-property location, like a realty office, to pick up the key. You will enjoy regularly scheduled housekeeping services. With owner-direct bookings, the unit may only be cleaned only after the guest leaves. If you need or want certain types of housekeeping or maintenance services during their stay, and if they booked direct with the owner, they may have to arrange for these services themselves, via the owner or the owner’s representative. If you book through the agent, we’ll take care of this for you. You will have overall peace of mind knowing that you have an experienced travel agent behind you if you need assistance to make your vacation experience match your expectations. It’s your vacation and your time to relax. Let us book your condo for you. Give R B International Travel a call to book your next Outrigger getaway to any of the Hawaiian Islands. The new Marco Polo Club Invitational Programs brochure offers a spectacular collection of off-the-beaten-path destinations and unique insider-access experiences for members of Abercrombie & Kent’s exclusive travel Club. A&K’s world-renowned Tour Directors lead journeys such as India’s Himalayan Kingdom of Ladakh (July 4-17, 2011), where you witness the Hemis Festival, a Buddhist celebration rarely attended by outsiders. On Laos & Myanmar Rediscovered (February 10-23, 2011), glimpse life along the Mekong and Ayeyarwady rivers, observing the ancient traditions of locals as you go. Contact R and B International Travel to order the latest Marco Polo Club brochure or to learn more about the benefits of a membership. Adventurers had been searching for the site for centuries, although nobody had been sure of its existence. News of the romantic find spread around the world, and Bingham would go on to become a US Senator. But the 1911 “discovery” was actually less heroic than it sounds: Bingham had actually been led there by a local farmer named Melchor Arteaga, whom he had met while camping on the Urubamba River. Far from being “lost,” the Peruvian peasants of the area had always known about the site, and gave it its name, Machu Picchu, which means Ancient Peak. Still, to modern archaeologists, Machu Picchu raises more questions than it answers. About 1000 people once lived there, in around 200 structures – but why was the spectacular citadel built? Bingham himself threw out wild theories: At first, he thought he had found the last refuge of the Incas who held out against the Spanish, Vilcabamba. (In fact, he had already come across the real ruins of Vilcabamba, which lay 60 miles to the west, and he had found them unimpressive). 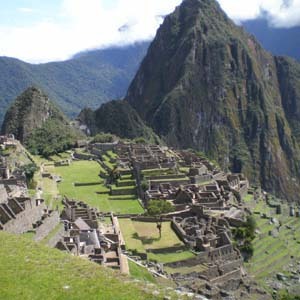 He then decided that Machu Picchu was the last holdout of Cuzco’s sacred Virgins of the Sun, who had fled the marauding conquistadors – and for want of another theory, this has certainly held the popular imagination. A century later, archaeologists are still arguing about the city’s true purpose. Most agree that it was an religious center for the Incas. Beyond that, speculation reigns. Was it part of a province wiped out in a rebellion? Or a royal estate supplying Cuzco with coca leaves? One thing hasn’t changed since 1911: Everyone’s first glimpse of the city poised high above the jungle-covered ravines is one of the most majestic images in South America. Set your own course for adventure when you take a Monograms vacation to South America. Contact R and B International Travel , and plan your adventure! By: Suzanne Slavitter CTP, CTIE of Sports Empire Inc.
We’re in the homestretch in the NASCAR Chase To The Cup, with the final two races in Phoenix and Miami remaining to decide who the 2010 Champion will be. Even though this season is drawing to a close, the kickoff for 2011 is just four months away — so many great races from the historic tracks at Daytona, Charlotte and Darlington — to the newcomers like Las Vegas, Texas and Kentucky. Decisions, decisions…should we head to the Superspeedway at Talladega, take in the short-track at Bristol? Do we upgrade our seats again—and should we experience pit pass and a hospitality package? Too many choices, but fortunately, there’s no wrong answer! 37 races to consider, each one with its own style and character. Time to make our decision—soon it’s gonna’ be time to go racin’ again! Secure your spot for one of next seasons exciting races, contact R and B International Travel today! Honeymoons too often take a backseat to the arrangements and plans of the actual wedding, but you owe it to yourself to give honeymoon planning greater and more careful attention. After all, while the wedding is mainly for your family and friends, the once-in-a-lifetime honeymoon that follows is a private getaway for you and your new spouse to celebrate your marriage. Though you may spend a porti on of your vacation relaxing and reflecting on this major life change, the honeymoon is most of all an opportunity to enjoy being a newlywed, spending quality time with your new spouse, and experiencing a romantic and exciting getaway. Honeymooners have endless options. Following months of wedding planning, couples often retreat to a luxurious resort that caters to their every need, while others trek to an adventurous escape from their day-to-day lives. Whether a beach vacation, a safari, or a ski trip, the honeymoon should reflect your joint personality and wishes. Your honeymoon can be the most romantic trip you’ll ever take, and it can also be a lot of fun. Look for a destination that offers everything you want. Remember that there is no “ideal” destination – the personality of you and your partner will determine where on the planet your honeymoon should be. However, the following locations traditionally are considered the greatest spots to honeymoon and top many newlyweds’ travel wish-lists. Continental U.S. – Many couples are drawn to distinctive locations throughout the United States. California, one of the most popular, offers marvels ranging from San Francisco’s Golden Gate Bridge to the glamour of Hollywood. Las Vegas, Nevada, always draws a lively crowd. Its incredible range of world-class hotels, casinos, entertainment, and shopping venues gives honeymooners an exciting vacation from home. New York, Florida and Colorado are also very popular destinations for honeymooners, as they offer fun and romantic tourist attractions that welcome visitors year-round. Traveling within the U.S. is an excellent opportunity to experience the unique diversity for which America is world-renowned. Also remember that you may need to psychologically accommodate to your new status as a partner and a spouse, and with proper planning and smart travel choices, you can enhance your opportunity to bond without undue stress over logistics or other complications. Your travel consultant can always develop a customized hon eymoon that provides not just a vacation experience, but a real journey for the two of you set in a locale that reflects your personalities and values. Contact R and B International Travel today to start planning your Honeymoon.